-Many of these spaces are on side streets and look, to neighbors walking by, to be private parks that are part of the adjacent building. -The original POPS law did not include any obligation to reveal the public aspects of these spaces, so for many of the earliest opened spaces no signage exists that they are public spaces. For POPS opened under amendments to the law ,the signage is generally minimal and is not very visible from the street. -The NYC Parks Department does not list these open spaces on their maps, nor for that matter do the vast majority of other city or privately published maps. 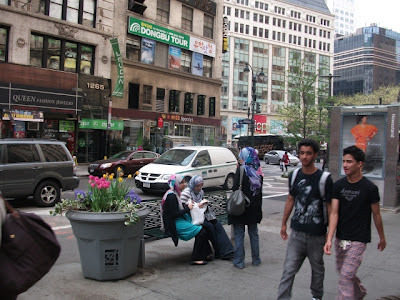 -"Greg Smithsimon, a sociology professor at Brooklyn College and co-author of The Beach Beneath the Streets: Exclusion, Control, and Play in Public Space, said that he spoke to a number of architects who were explicitly told to dampen their POPS, sinking them below grade or behind fences, anything to make them uninviting." Upon first being shown the 2012 ParkChelsea map, one Chelsea senior noted that for years she would be coming home from shopping with heavy bags, she would see one of the listed areas, but thinking it was private property, just walk past it. Now she knows it is a public open space where she can stop and rest on her way home. This map will be of use to Chelsea residents of all ages, from the mom with young kids looking for a place to sit outside with a stroller, to Chelsea’s seniors who will now be able to easily locate available seating near wherever they are in the neighborhood. When presented with copies of the 2102 Park Chelsea map, Congressman Jerold Nadler and Manhattan Borough President Scott Stringer were delighted with the concept. 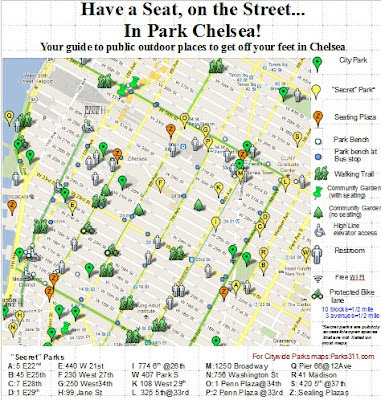 ParkChelsea’s plan for the upcoming months is to work with Chelsea public officials, store owners and media to make this map available throughout Chelsea. 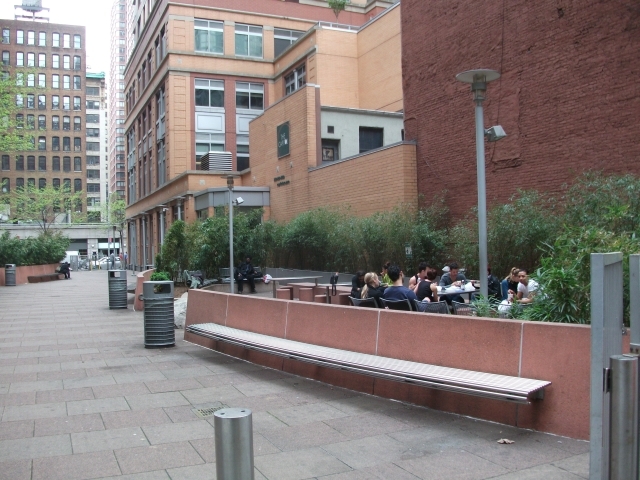 "Privately Owned Public Spaces, abbreviated as "POPS", are an amenity provided and maintained by a developer for public use, in exchange for additional floor area. POPS typically contain functional and visual amenities such as tables, chairs and planting for the purpose of public use and enjoyment. 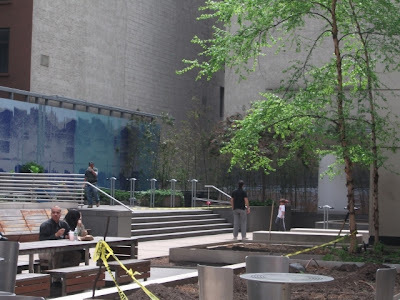 Privately Owned Public Spaces are permitted in the City’s high-density commercial and residential districts and are intended to provide light, air, breathing room and green space to ease the predominately hard-scaped character of the City’s densest areas." Madison Belvedere, 28th, between, 5th and Madison. 12,000 square feet, Built 2001. Children can play in the grass here!. There were a handful of people there on the Sunday this picture was taken, and as you can see NO ONE was using this great grass playspace. 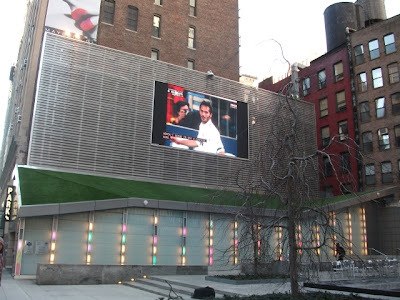 Big Screen Plaza, between 29th-30th off 6th Ave, 10800SF Built 2011 I stopped by here one evening and found that a group of kids had turned the 29th street side of it into a skateboard park. 774 6th Ave between 26-27st, 10100 square feet, built 2002. 239 West 27th between 7th and 8th 3,100 square feet, rebuilt circa 2011. 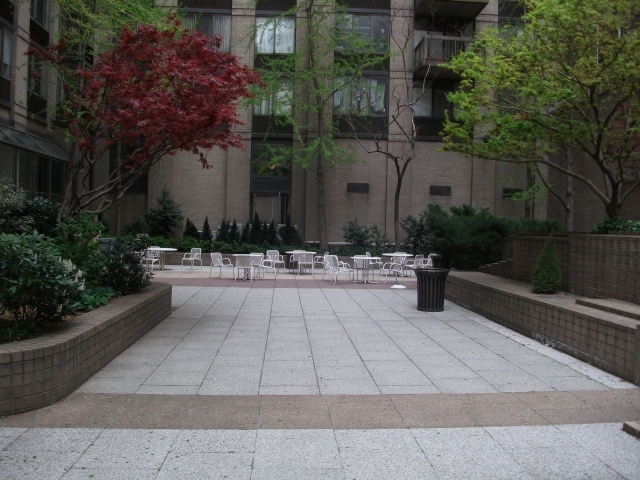 This space has no signage that indicates it is a public space. 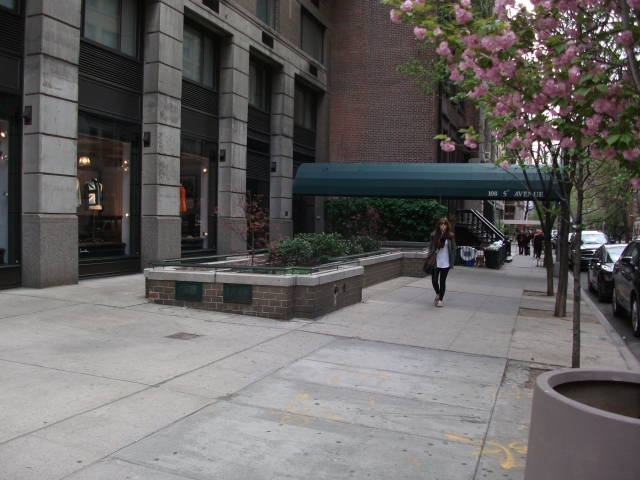 325 5th Avenue, entrance on 33rd st, 8200 square feet park. Built:2011. 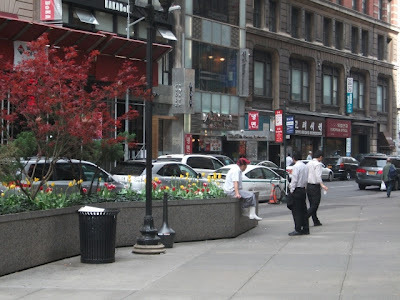 "This corner plaza is required to have a bicycle rack, a water fountain, a bench, a certain number of trees, etc. The building removed the bench years ago when they renovated the building and put a sign that it would be replaced. It never was. The water fountain, gone. The bicycle rack, gone. They have recently renovated the planter which sat empty for so long but none of the other amenities are available so there is really no public use except to walk through. There were frequently homeless people on the bench which is why I suspected they removed the bench. Shameful. They were required to put these amenities in place in order to build the building but they removed them and no one enforces the agreement. Shameful again." Alice's Garden, named after caretaker Alice Parsekian who pruned and watered the flowers in the West 34th Street space for more than 20 years until her death last year, will now be managed by the Hell's Kitchen Neighborhood Association (HKNA) and Clinton Housing Development Company (CHD). While the Port Authority still owns the land, it will lease it for $1-a-year to the HKNA and CHD. 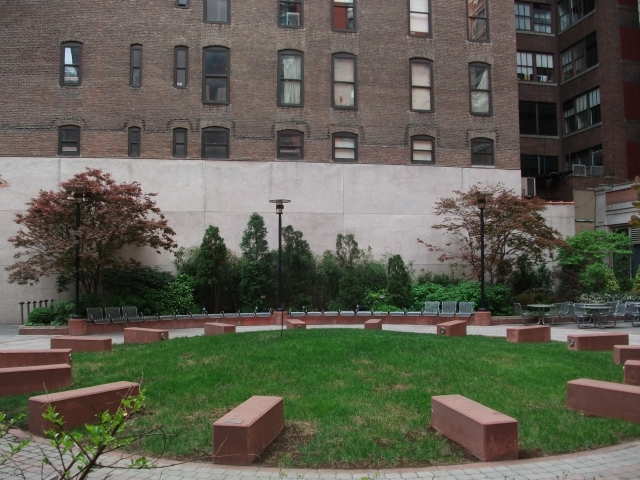 "It's like a secret garden, in a way," said Kathleen Treat, president of HKNA, of the greenspace between Tenth and Eleventh avenues. There are over 500 POPS in Manhattan. 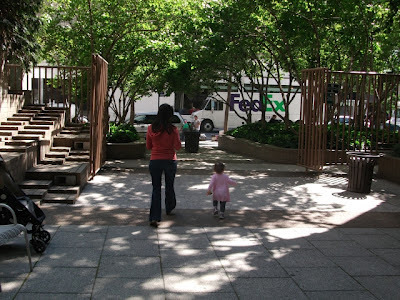 Some of these are marginal spaces others equal to the best of NYC's publicly owned parks. 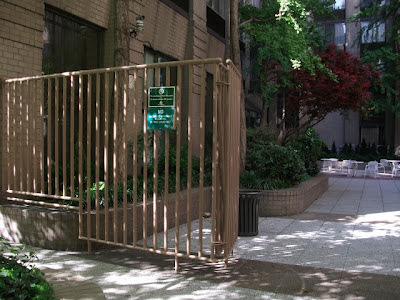 Many of these have the same issue that the POPS of Chelsea do that there is either no signage or minimal signage to let residents know that these are public spaces. ParkChelsea feels that it would be of great value for every community in Manhattan that has these POPS to offer its residents a map similar to the ParkChelsea map. On a Brian Lehrer radio show, a caller who lived next to a building with a POPS space called in and said that until learning that there was a POPS next door to where she lived, she had no idea there was one. The sign below is the current sign standard for POPS. 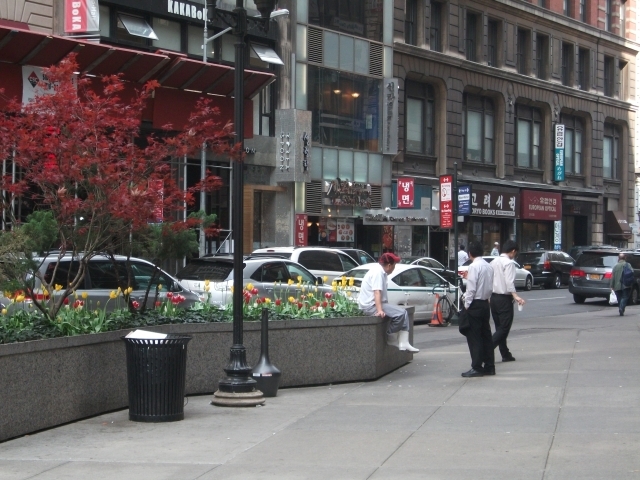 Many older POPS have no signage, minimal signage or signage that is invisible from the street. ParkChelsea recommends that NYC posts signage as this on city Parking posts near POPS to make the existence of these spaces visible to people in the neighborhood. 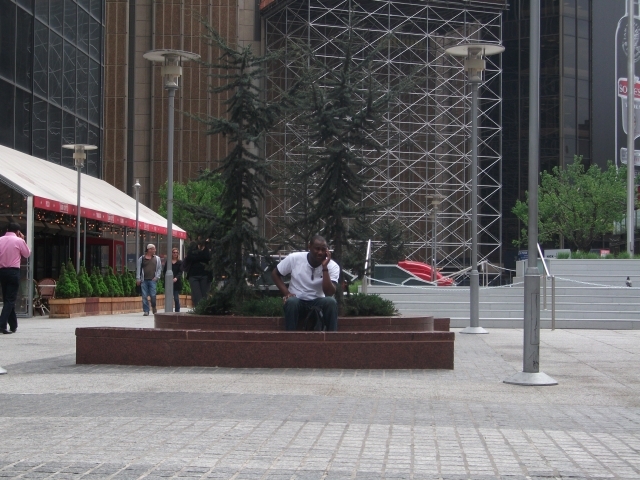 This study of why most of these centrally located bonus plazas are paradoxically unused by the public finds that exclusion itself is actually an objective of private developers of public space. “Believe it or not, the neighborhood has much less park space than most of the city,” local councilman Dan Garodnick told The Observer. “My district ranks 51st out of 51 neighborhoods.” Falling just after Midtown East is the tony quarters of the Upper East Side, 46 out of 51. "Consider Le Parker Meridien Hotel. One of three mid-block POPS connecting West 57th and West 56th Streets, the hotel’s two-story polished marble lobby, complete with bellmen and security, is part of the 6,820 square feet of space exchanged for thousands of square feet in additional developable floor area. 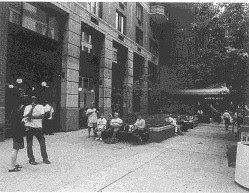 A narrow arcade linking the lobby to West 57th Street acted as a coffee bar until a freak concrete spill last month shuttered Knave, as it’s known. 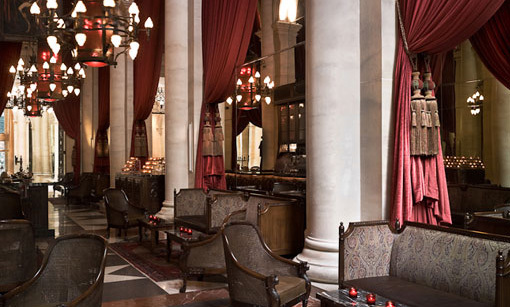 The place appeared so private prior to the spill that it apparently fooled the New York Times, which described it as “a gracious room normally swathed in red velvet curtains, where a hot chocolate costs $6.” No mention was made that it was actually a public space. Or that it had been at the center of lawsuits in the early 1990s for violating its original purpose: to improve pedestrian circulation." [A "Rule of Conduct"] sign shall not prohibit behaviors that are consistent with the normal public use of the public plaza such as lingering, eating, drinking of non-alcoholic beverages or gathering in small groups. 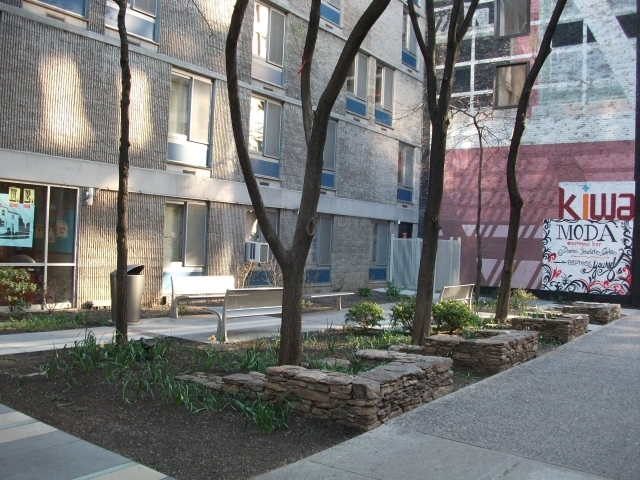 At the end of March, both City Council Speaker Christine Quinn and the Mayor went on the record to support the idea that POPS should obey the Rules of Conduct for New York City parks, which include, for most parks, nighttime closings and time-tested regulations against both commercial and private activities, including camping.